Judging by the size of my mitten collection, I have quite a addiction fondness for them. They're just so much warmer and happier than gloves to me cause your fingers get to stay together. I'm not purchasing any more at the moment since I have close to 20 pairs but that doesn't mean I can't still scope them out and these styles have caught my eye. I have a pair that looks alot like no. 2 and the pom poms are so fun. Do you wear mittens? Which pair would you pick? Thanks for the very kind birthday wishes! We did brave the 10 degree weather and had a nice lunch at Miss Korea BBQ which is a fave. It wasn't so bad out if one was properly bundled and the wind didn't blow. The streets were oddly quiet. We picked up some treats including an incredible savory cheese donut from Paris Baguette and just chilled at home afterwards. I actually took a nap and it was awesome. It felt good to arrive at this birthday given the various ailments that I've been dealing with in the past year. And hubster gave me with an item that I'd been coveting for awhile. I hope to share it with you all in a photo with Rena and Ian soon. Jury duty worked out great too. I had to call in for 2 days and wasn't needed so I was dismissed without ever having to show up at the courthouse. Oh mittens! You picked some really cute pairs! Beautiful mitten I like wearing them to play in the snow I usually wear two for my hands wont get cold l laugh with the shady lady to funny great post doll. Have an awesome weekend. I love these they are so cute and look like a lot of fun to wear. And I love mittens too:) They're actually pretty easy to knit as well. Glad to hear you had a nice birthday, Rowena. Not a big fan of mittens to be honest, but reading this post made me feel good. So cute, it never gets too cold here to where I need ones but I dont mind having some for sure. Have a good weekend Rowena. good to hear that you had a good birthday! and thank goodness about jury duty! i got called in once but was dismissed as the trial never went forward! I think mittens are so cute but they just annoy me when I wear them haha! I'm glad you survived the weather! It's been the same kind of ridiculous cold where I am too. I like mittens because they are warmer than gloves, but I only wear them when it's really cold because they can be a little cumbersome when it comes to trying to use your hands. Love gloves need some to survive also! Cool, warm gloves!!!!! I love them all!!!!! Have a fab ENE of the week Rowena! I really love mittens this winter. They make such a significant difference in warmth for me! The last ones are suuuper cute. happy to hear you had a good birthday. These mittens are too cute, I only have 2 pairs, its not that cold here but I would really like a few more colourful pairs. Have an enjoyable weekend dear Rowena! Love them all but the first pair are my fave! Mittens are the cutest! I'm loving #2 with the pom poms on them. Sounds like a great birthday Rowena. It's all about doing things you love. So good for you. You lucky girl!!! They make us sit there half a day and then tell us they don't need us. LOL It's crazy! :D Wishing you a wonderful weekend. 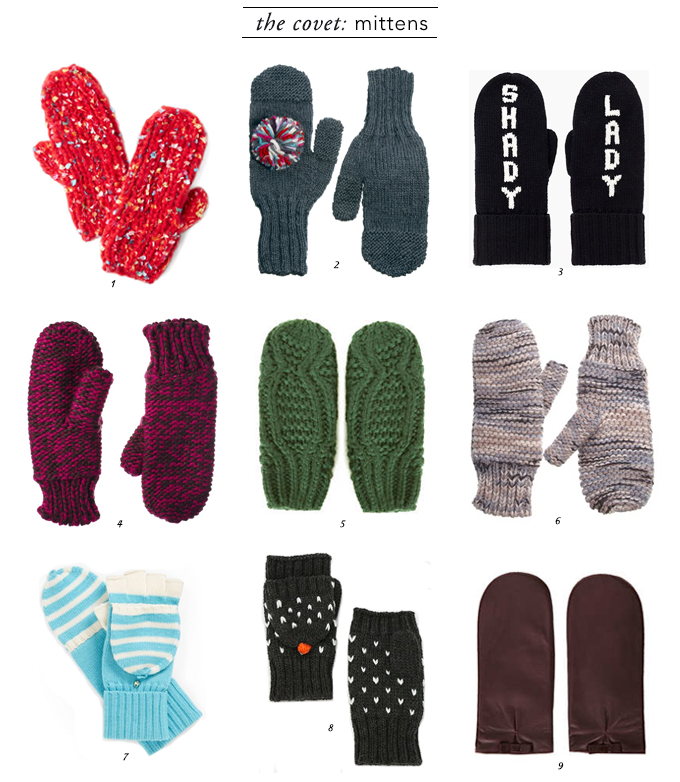 Wow so many mittens to choose from! It's overwhelming hehe. We definitely need them to keep us warm for the winter <3 great post! Wow 20 pairs? are you serious? Well dont know anyone else who has so many:). We dont wear them here but when I did live in the US I just owned about 5 and that was it. I miss a few posts and end up missing your birthdate and jury duty updates???? Mittens are adorable. I've wanted a pair for the last few winters but I can only ever find gloves. It never gets cold enough here to wear mittens, though I'm really loving the look of #8, so cute! great selection - 3 and 9 are my fav's! Oh boy I do need more of these! Big time. So over the polar vortex. Great round up. Oh my god, I love those gloves!! they are all so cute !!! I'm so glad you didn't have to go to jury duty on your birthday! It must have felt like a present. Barbecue sounds good. I don't eat meat but I think it would be fun to cook food right at the table. I have been watching Creating Destiny and the two leads are over-acting so badly it's almost painful, of course that hasn't stopped me from getting 10 episodes in. I agree about INR2012, I didn't think it was terrible but they could have completed the whole story in 5 episodes if they took out the annoying flashbacks they played over and over. How is Emergency Couple? I am hemming a pair of pants up again. It's such a good idea to hem in the middle of the heights you need but sadly I only wear flats, I just can't get the hem height right. What pretty mittens. My favorites are the shady lady ones. Happy Belated Birthday- it sounds like you had a nice one! :) These mittens are so cute- I love the ones with the tiny hearts that convert from fingerless gloves to mittens. Haha, you own 20 pairs of mittens!? Dang girl! : ) I only own one pair, but I've been wearing them nonstop because it's been chilly in Seattle. I love the styles you selected. My favorite is number 9. I've never seen pleather mittens before. So chic and cute with the dainty little bow!